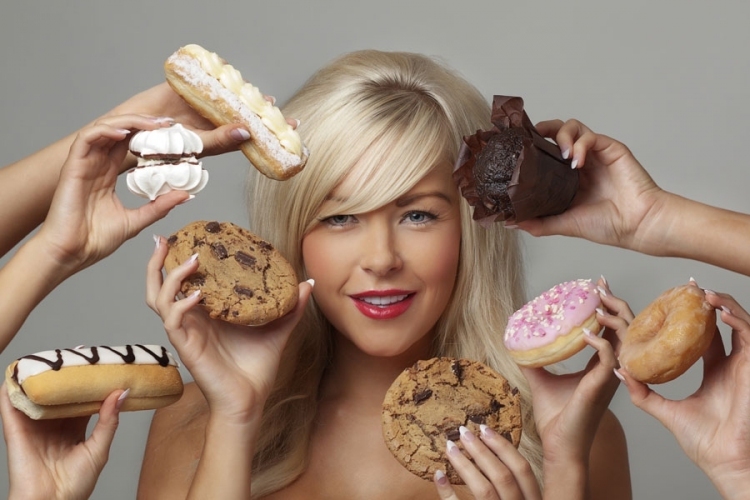 We are repeatedly exposed to food temptations 24/7, three-sixty-five. It’s a constant, but winnable battle. One key component to any successful weight loss plan will be your biggest ally in this fight – awareness. One of my online training clients who has lost 24 pounds recently sent me a list of how she was tempted by food during her day, and how she reacted. It’s a testament to her success and to the power of awareness. Arrived at health club early to get some laps in since I was skipping both the aqua and yoga class that I normally do (because of my packed schedule). Was offered a GIANT chocolate chip muffin at the club because it was holiday weekend. No. Went to 8:30 hair appointment for an overdue cut/color. Complimentary donuts/coffee for patrons. No. Picked up birthday cookies at bakery. Did not even look at anything else. Lunch out “with the girls” at a nice restaurant. Gave everyone cookies. Did not have one. Left lunch early to attend my company picnic (chicken, hot dogs, hamburgers, chips, sweets). Did not eat anything. Had a bottle of water. Got home just in time to shower/change for family dinner at a fancy restaurant. A cousin brought a huge cake. Did not have cake. My calorie count for the day was still high. In fact I just realized, I missed a glass of wine. Overwhelming. This is a compelling example of how we are continually bombarded with food temptations and how awareness in all our choices, at every turn, is so important. For one day I want you to write down every food temptation that comes your way. Write the temptation, the time, and how you reacted to each. Just one day. Pay close attention to what is making my client successful – planning, preparing, tracking and diligent awareness. You can do it too. Let me help you. 2 Comments to "Victory Over Food Temptations"
I applaud your client for resisting so many temptations IN ONE DAY! That is fantastic! Even though she said her calories were high, they could have been much higher! I feel like I stress out everyday over food temptations. I fight them all day long, and sometimes, I give in, and then I really hate myself. I am angry because I think I should be able to have a cookie or a muffin or a piece of cake NOW AND THEN and not feel like a failure because I’m weak and gave in. I am tired of feeling guilty, of feeling like I don’t have the willpower or motivation. I am angry at myself all the time. Hi Lori and thanks for posting. Yes she is a very determined client and readily admits how stressful these food temptations can be. She started journaling the food temptation episodes because she became so aware how much food is put in front of us all day long. On the one hand we’re told to not gain a lot of weight and to be fit. Then we have all this food in front of us all day long. It’s not wonder people get frustrated. As far as your situation – you really should be able to have a cookie or muffin now and then and not look at it as something bad. I think total denial of certain foods isn’t the way to go. The key is to plan them into your day. What some of my clients do is build a certain amount of ice cream or a cookie into their plan. This way it’s accounted for in total calories and helps one to feel like they have a sense of awareness and control. And, they still get to have some treats now and then. Thanks again for your post and please let me know if I can ever be of help!